Hi I’m Peter. I’m 27 years old and I’ve been a full time wheelchair user for the past 8 years. I became paralysed at T10 complete from an accident I had whilst working as an electrician on a building site in January 2011, when I was just 19 years old. I have also survived sepsis and have since had 2 full on strokes, but don’t let anything hold me back and continue to live as active a life as possible, constantly pushing the boundaries of what’s possible. I have always been an adventurous person long before I ended up in a wheelchair and I suppose that has just continued on. I’ve never been afraid to try something new and a couple months after I came out of hospital I met a friend in the street called Leroy, who is sadly no longer with us. He introduced me to wheelchair basketball and I became hooked by the end of the first session. It was through wheelchair basketball that I met friends that did other sports like wheelchair tennis, Para swimming and wheelchair racing. I went along to a couple of sessions, fell in love with them, all and have never looked back. I had a bit of a setback about a year after coming out of hospital from my accident as I had 2 full on strokes in pretty quick succession. I completely lost the use of my right arm and my speech was severely affected too. It took me a good 18 months of pure determination and a lot of physiotherapy to regain the full use of my right arm and make it strong again and a good year to be able to speak normally again. It was while recovering from my second stroke that I saw a video online of a guy who had also suffered a stroke attempt a 10k and that gave me the idea to do something similar from my wheelchair. I used to run before my accident and seeing this guy attempt a 10k reignited something within me. I wanted to do a marathon from my wheelchair. Ok I didn’t have the use of my legs and at that point I only had the use of one arm, but I wasn’t going to let that stop me and I was determined to make it happen!! It took a lot of training and a lot of early starts but after just 5 months, I entered myself into the Hackney half marathon. I turned up on the day and was the only guy in a wheelchair competing. I wasn’t going to let that stop me and was determined to prove everyone wrong. I’m happy to say I did exactly that, I didn’t care how long it would take me, I just wanted to finish and finish it I did. I was so happy when I crossed the finish line and I did it pushing my wheelchair with just one arm too. After the success of my first half marathon from a wheelchair, I was inspired to enter more marathons and almost 7 years later I’m still doing it. It was not long after completing my first half marathon from a wheelchair that a friend got in touch and asked me if I fancied doing Para triathlons. Thought I’d give it a go and so I went along to my first Para Triathlon training session. I took to it like a duck to water and absolutely loved it. It wasn’t long before I got my own hand cycle and entered myself into my first Duathlon, a one mile push in my regular wheelchair, followed by a 5 mile hand cycle ride and then another one mile push to the finish. It was an able bodied Duathlon but they let a couple of us with hand cycles take part. I did well in my first Duathlon and beat a few able bodied people too. Didn’t set out to do that but was incredibly chuffed with what I had achieved. After the success of my first Duathlon I was inspired to enter a few more races and started training for my first full Para triathlon. I was pretty strong with the hand cycling and pushing elements but my swim needed some work and due to my disability I was only able to do breast stroke. Again, I wasn’t going to let anything stop me and persevered with training. Within 4 months I had made my swimming a lot stronger than it was and put myself forward for my first Para triathlon. Needless to say I absolutely smashed it on the day. I was over the moon with what I had achieved and wasn’t going to stop there. You really can do anything if you put your mind to it and I’m living proof of that! I’m constantly pushing the boundaries of what’s possible and that’s exactly what I did again last Sunday at the Wimbledon common half marathon. 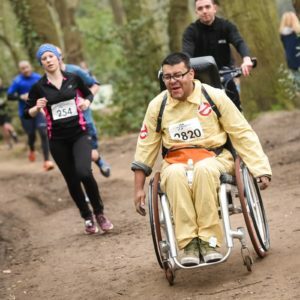 I knew it was a trail course and that it would consist of mud tracks and steep hills but I wasn’t going to let that stop me and was determined to not only tackle the course in my wheelchair but to finish it too and that’s exactly what I did. I also have a friend whose going through a really tough time in hospital right now and I wanted to do it for her too to cheer her up a bit – think I managed to do that! I do between 5 and 6 marathons a year, some for charity and some just for fun. With each marathon I do, I dress up in a ridiculously silly outfit and this time was no exception. I did the Wimbledon half marathon in a Ghostbuster outfit complete with proton backpack. I previously did the vitality big half in a big blue baby romper suit and have done marathons in a shark outfit and a lobster outfit too. For my next event at Goodwood this Sunday I’ll be doing the marathon dressed in a big yellow tele tubby outfit. I’m a big kid at heart and the outfit adds a bit of fun into the mix. It gets people talking too, which can only be a good thing. Doing marathons and keeping myself active gives me focus too and also helps me to take my mind off things closer to home. I suppose it has become a form of coping mechanism. It has helped me in so many ways and continues to play a big part in my life. I’ll be doing a half marathon at Mercedes-Benz World next month, the Norfolk classic hand cycle race on the 12th may and will also be doing the London to Paris bike ride for Great Ormond Street Hospital with my hand cycle at the end of July.